This comb binder machine creates documents with a professional comb binding. There are many ways to bind a book. Each type of document binding has its own unique style and applications. It’s important to know when to use each of these types of binding. Using the right kind of binding can increase the professional look of a book or manual, which is good both for your clients and you. Here are 6 types of document binding and when to use them. Saddle-stitching is a method of document binding which secures loose leaf papers down the middle with staples. 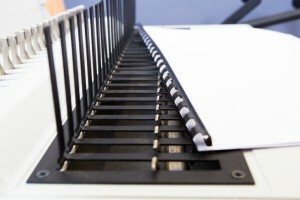 Saddle-stitching is a cost effective way to bind booklets and smaller, less formal materials. Comb binding has been around for over 40 years and is the most common binding style in North America! Comb binding is so popular because the plastic binding allows the book to open flat to make pages easy to copy. It is also an economical type of binding, but the teeth do tend to break over time with repeated use. Spiral coil binding is sturdier than comb binding and looks great on presentations and proposals. A single piece of spiraled plastic is wound through the edges of a book, creating a final product that is sturdy and looks presentable. Because spiral coil binding is available in over 60 colors, marketing and design firms will probably find great use of of spiral coil binding that matches their company logo and color of the front page. Coil binding shares comb binding’s ability to allow pages to wrap around to the back for easy copying and reading. Twin loop wire binding involves wire binding that is double-looped for style and durability. While twin loop wire binding is slightly more expensive than coil binding, it offers an elegant style that may be worth the extra cost for some companies. However, twin loop wire binding may bend if something heavy is placed on it. Velo binding is essentially the opposite of comb binding or coil binding. 11 small holes are punched along the edge of an unbound book. Two rigid pieces of plastic are placed along the spine on the front and back of the book with tines connecting the pieces and holding the book together. This makes the book very difficult to copy. This style of binding is great for sensitive documents that the owner does not want copied. Plus, books with velo binding look sleek and professional and are easy to stack. Perfect binding is the kind of binding you see on paperback books. This type of binding is great for both books and presentations alike. While you can’t remove pages and pages are more difficult to copy than books that are bound with comb or coil binding, you gain a finished product that is easy to stack and looks super professional. If you are interested in buying new or used binding equipment for your printing press company, then check out the binding machines that Atlantic Graphic Systems has to offer! This entry was posted on Friday, February 19th, 2016	at 10:43 am	and is filed under industry practices	. You can follow any responses to this entry through the RSS 2.0	feed. Both comments and pings are currently closed.